A mysterious fake tree recently appeared on the Red Line&apos;s center platform at Park Street Station. The tree showed up sometime after Thanksgiving. MBTA workers are clueless about its origins, and no one from the transportation agency has taken responsibility for putting it there — though that’s what some riders presumed happened. “It’s unclear who placed it there or why,” T spokesman Joe Pesaturo said in an e-mail Wednesday. 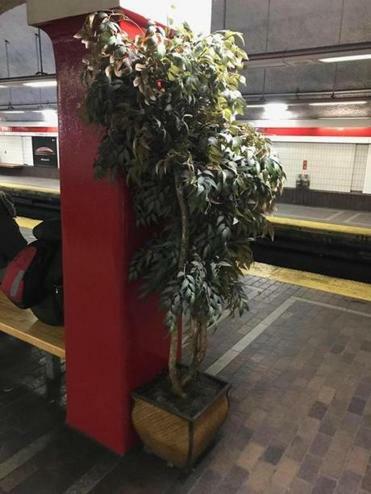 For more than a week, the puzzling and sudden appearance of the large potted plant, which has found a home on the center platform of the Red Line’s Park Street Station, has perplexed commuters and transit employees alike. Despite the mystery, there are no immediate plans to remove the fake ficus in the wicker basket, officials said. In fact, some people seem to be enjoying its presence (others have been making jokes about it), and so, for now, it remains. But it is grabbing their attention. Tuesday, Nov. 27, a few days after the Thanksgiving holiday weekend, seems to mark the earliest reports of the tree’s strange arrival. Cindy Scopa, a Red Line inspector who has worked for the T for the past 18 years, said she showed up to work early that morning to open Park Street Station. As she walked onto the platform, there it was. Unfortunately, they didn’t, they told her. Scopa and her co-workers are not alone in their quest for reason. Riders have been scratching their heads about the lanky tree and its bushy leaves. Around the time that Scopa discovered the tree — which is directly outside the inspector’s booth, against a pillar — passengers also took notice. One commuter, apparently seeking answers last week, decided to take a picture of the tree and send it to the community blog Universal Hub. That inquiry bore no fruit, however. “Looks like the T is sprucing up Park Street,” the website surmised, eliciting criticism from readers who assumed the T was behind it. Another rider came up with a snarky way to explain the tree. In a tweet, the person joked that the MBTA likely introduced the tree to the station to “balance out” the familiar smells of the transit system. Some time went by and the tree seemed to blend in with its surroundings. Then, this week, the discussion about its existence was back on the table. On Wednesday morning, a passenger took a picture of the tree while riding on a Red Line train and then turned to Twitter’s hive mind for some clarification. The answer? The sound of crickets. When asked whether the T could just check surveillance footage from the station to determine who lugged the tree down there, Pesaturo, the T spokesman, said they haven’t narrowed down the exact time frame of the tree’s arrival. In the meantime, T workers like Scopa are enjoying the new greenery. She said the tree has been getting favorable feedback from customers, too.